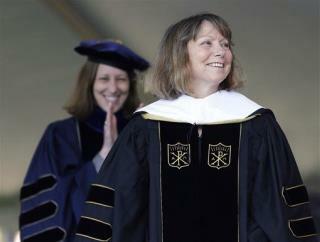 (Newser) – Jill Abramson and President Trump appeared to be in unlikely agreement that the New York Times was running stories that "were unmistakably anti-Trump"—but very briefly, and now the former NYT executive editor is hitting back at coverage of her upcoming book, saying it was taken "totally out of context." "Donald Trump is echoing a piece on Fox News (surprise) that distorts ... what I wrote," she says, via the Guardian. "Both the NYT and [Washington Post] have had superb coverage of the corruption enveloping the Trump administration, the best investigative reporting I’ve seen." OMG! I know her. I did her in high school. She was hot! Still looks good! I'd still do her now. She was good. Like all night long. Hi Jill. Call Me!! You gotta be kidding me...an ex NYT editor complaining about her words being taken out of context?! That's like karma of the century. I'm sure she received death threats from anti Trump democrats...that's usually why people backtrack after being truthful.